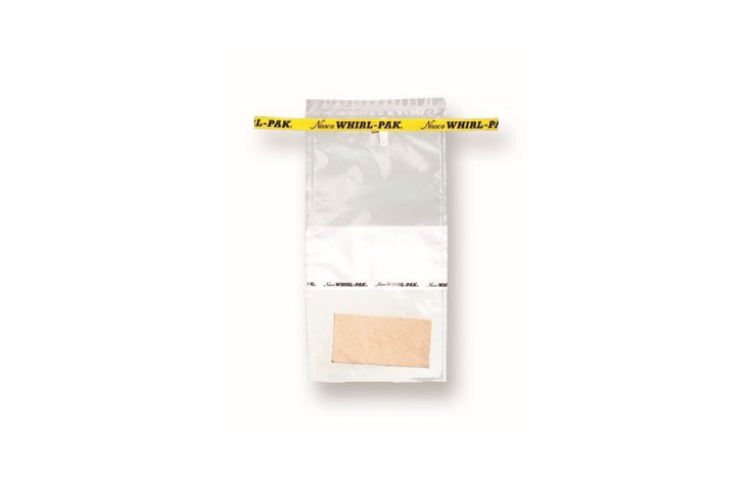 The Whirl-Pak Speci-Sponge bag is designed for environmental surface sampling of work areas, equipment, animal carcasses, and any other place where testing for Listeria, Salmonella, E.coli, coliforms, and other foodborne pathogens, or anthrax is required. The special dry sponge is free of bactericides and has been tested to be non-inhibitory. It measures approximately 1-1/2" x 3" x 5/8" (3.8 x 7.6 x 1.5 cm) thick when wet, and is sterilized inside a Whirl-Pak bag. Wearing a sterile glove when wiping with the sponge is recommended to help prevent contamination. After the sample has been collected and the sponge returned to the bag, it can be sent to a lab for testing. In the lab, media may be added directly to the bag and the sample incubated inside the bag for a +/- test, or the sample may be squeezed out of the sponge, pipetted, and plated out.